Eighteen art students from R. Rex Parris High School and several volunteers "Yarn Bombed" City Hall Wednesday. 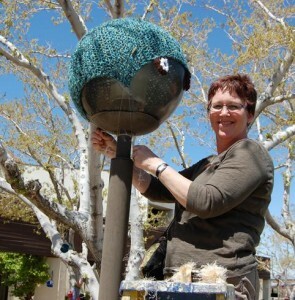 Jenny Mauss, from Project Linus puts pom poms on a "tree sweater" as part of the Yarn Bomb event. LANCASTER – Lancaster City Hall was alive with color Wednesday. 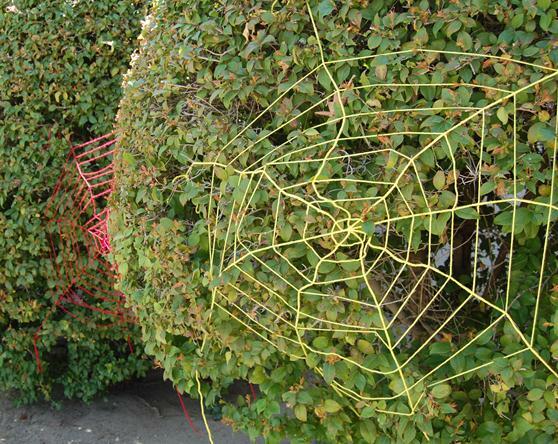 Colorful knitted spider webs covered hedges, flamboyant scarves and sweaters wrapped around tree trunks, crocheted lollipops and God’s eyes hung from branches, and vibrant pom poms sprouted out of potted plants. 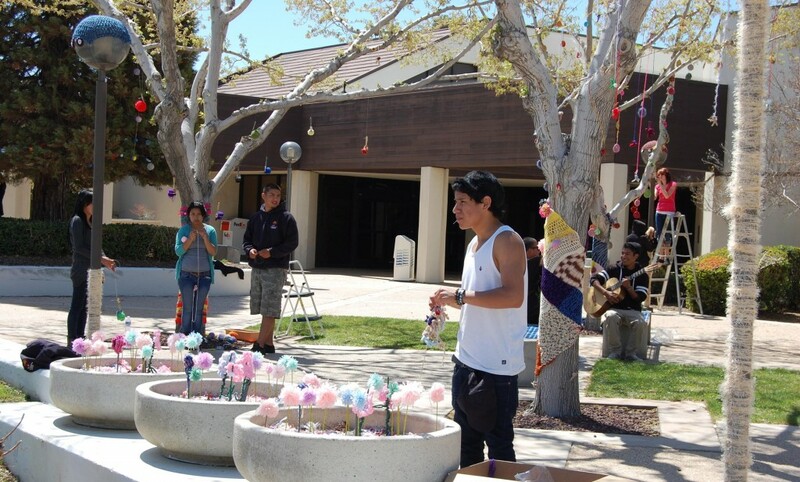 The decorative flair was added by 18 art students from R. Rex Parris High School and several volunteers as part of a “Yarn Bomb” event that took place from 8 a.m. to 2 p.m.
“I want people to pass by and see this and be like ‘that’s pretty cool, it’s something new,’” said Miguel Monasterio, a junior at R. Rex Parris High. Kathleen Carpenter puts a cap on a light post. Carpenter helped come up with the idea. Yarn bombing or “yarnstorming” is a new fad where those who knit and crochet create random acts of public art, knitting scarves around tree trunks, cozies on bare metal bike racks, and decorative covers onto benches, lampposts and even sculptures. Holladay said she got the Yarn Bomb idea from her sister, Kathleen Carpenter, who teaches a class on fiber for art students at R. Rex Parris High School. The sisters came up with the idea to make use of a large donation of yarn, crochet hooks, and knitting needles the school received from Michaels Arts and Crafts Stores. 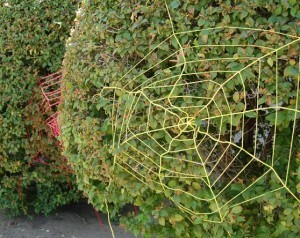 Students placed spider webs on hedges. Holladay was originally going to have her students Yarn Bomb the schoolyard, but decided to expand the idea to Lancaster City Hall to commemorate the opening of the annual student art exhibit that kicks off Thursday. Holladay is the faculty liaison for the 27th Annual Antelope Valley Union High School District Art Exhibition, which will display at City Hall from April 5 – May 20, 2012. She said her students will be wearing knitted scarves to the opening so attendees can recognize them for their Yarn Bomb creations. The opening, a free public reception, will be held from 5 to 7 p.m., Thursday at Lancaster City Hall. 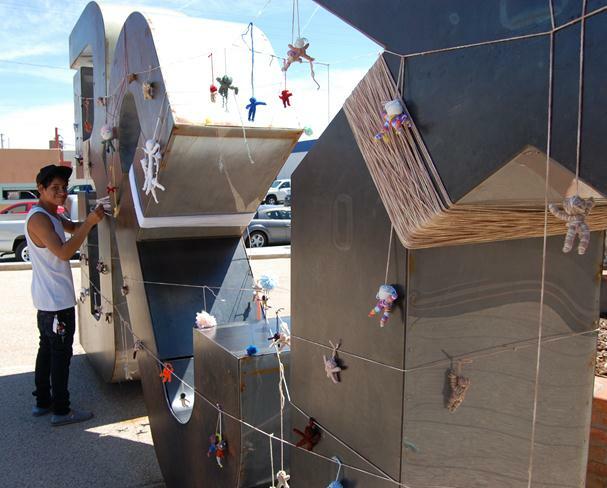 Weather permitting, the Yarn Bomb creations will be displayed outside City Hall for the entire duration of the student art exhibit, said Holladay. 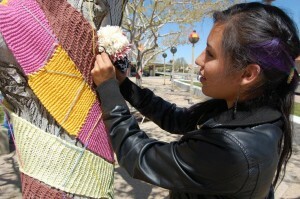 Students also Yarn Bombed Bex on The Blvd. Miguel Monasterio created the miniature yarn characters and hung them on the Bex sign to create the "Hanging out at Bex" art exhibit. 2 comments for "Yarn Bombing City Hall"
BeX looks great! This is an excellent form of non-destructive graffiti and 100% art..
Nice to see that this form of graffiti has finally hit Lancaster. But watch out for those “God’s eyes” at City Hall. Separation of church and state, remember.